How Can I Buy Tickets for Italian Trains Before I Go to Italy? If you're planning a trip to Italy and plan to travel by rail, you may wish to buy your train tickets in advance. While you can usually buy Italian train tickets right at the station in Italy, it's usually more convenient to buy them ahead of time. This is in part due to long lines at the ticket windows at some stations – you don't want to miss your train because the ticket line didn't move fast enough! You can check schedules and buy tickets on Trenitalia, the Italian national train site. Though you're given the option of registering on the site, you do not need to do so in order to buy tickets. Start by selecting whether you want one-way or round-trip travel, then start typing in your station of origin. A pop-up menu of cities and stations will appear. For example, you can choose to search itineraries from "Roma Termini" or from all Rome stations by selecting "Roma (Tutte le Stazioni)" if you have more flexibility. Go through the same steps to select your arrival city/station. Select the date and time of your desired departure (remember that in Italy, dates are listed day-month-year and times are on a 24-hour schedule (eg: 2 pm is shown as 14). Then select the number of passengers and click "search". Select your desired train from the list of results. Make sure to check if you are required to change trains. Once you've picked the journey, you may be prompted to select class of travel (1st or 2nd). Because quality, comfort and cleanliness can vary so widely on Trenitalia trains, it's difficult to say whether it's worth it to pay the difference for first class travel – it may be nicer or it may be largely the same as second class; it just depends on the train. You can pay for your tickets using a credit card or PayPal. You'll be emailed within moments of payment confirmation a receipt and an e-ticket, in PDF form. If you're buying tickets for more than one person, there will be multiple tickets within the same PDF. You can print out the PDF pages, but you don't have to if you have a smartphone or tablet with Wi-Fi that functions in Italy. In that case, you can just open the PDF on your phone or device when the train conductor approaches. He or she will scan the QR code on your PDF and you'll be all set. You may be asked to present a photo ID, but this is usually not the case. 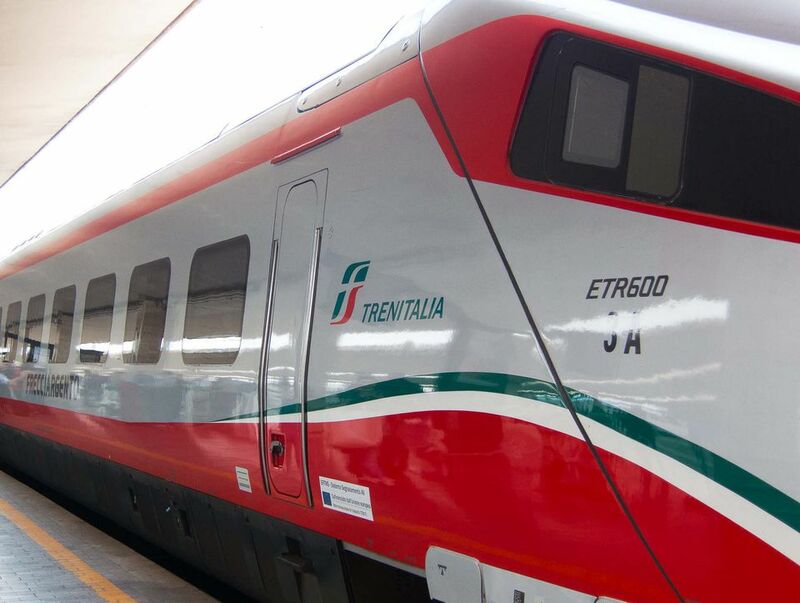 Important Note: Most Frecce (fast train) and intercity Italian train tickets are only sold within four months of the actual travel date (and sometimes less) so you will usually not be able to purchase tickets more than four months in advance. The same is true for tickets on Italo. Unless your plans are set in stone, we usually don't recommend buying regional train tickets in advance as there is no discount. They can easily be bought at the station ticket office or a vending machine. This allows you more flexibility, as your plans may change. If you buy regional train tickets online they will be for a specific date and time. Regional train tickets are inexpensive, you can buy them at the station, and they are good for two months. Reserved seats are not available on regional trains (short distances on trains that stop at more stations). If first class is available, it may be worth the extra cost if you're traveling at rush hour or with luggage as there's usually more room in first class. Important Note about regional train tickets: If you have a paper train ticket, you must validate it in advance before you board the train unless the ticket has a specific date, time, and train number on it. You can be fined on board if your ticket is not validated (yes I've seen it happen many times). See how to validate your train ticket in Italy. If you are traveling between major cities, you may want to look into Italo, the private train service that uses the national rail track system. Its high-speed trains are new and rather plush in comparison to Trenitalia, and there are different classes of service available. But Italo is only an option for longer journeys from one big city to another, so you can't get to any smaller towns using this service. Italy rail passes must be purchased before you get to Europe, within six months from the date you plan to validate it. Check prices of or buy a Eurail Italy Pass through Rail Europe. What Is Italy Like During a Winter Vacation?